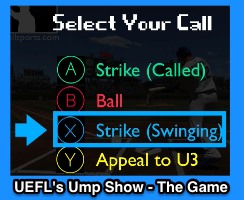 Today we are proud to introduce UEFL's Ump Show, the video game that puts you behind the plate as an umpire for a virtual big league baseball game, giving you the chance to call the action to 100% accuracy...or turn it into a real #UmpShow full of ejections and controversy. Umpire Ejection Fantasy League, in association with Close Call Sports Media Group, has taken officiating mechanics and created a virtual world that rivals the best baseball simulations in the market, you know, the mainstream abominations that restrict the user to controlling players and teams. Ump Show has none of it, dedicating its revolutionary Dana DeMicroSAM™engine to the boys and girls in blue and black...but be forewarned: as in real life officiating, there are no slow-motion replays (unless you're playing in Replay Official Mode™), and one shot at full speed from the angle you have chosen is all you get. Our program doesn't even have a pause button, allowing for the mini-game, "Sprint to the Dugout Bathroom," a 60-second journey down the stairs. Want to run the skip? It's your call to make. And if your calls don't meet to the realistically irrational satisfaction of either manager produced by our cutting edge Mattingly Algorithm™, you'll hear chirping and gain access to Ump Show's state of the art Game Management Feature™, where you can discipline or ignore potential misconduct by issuing warnings and ejections. Careful! If your fuse is too short, you'll see a TILT (Trigger Initiation Limit Tool) and receive downgrades from BOB™, your virtual supervisor (derived from "RoBOBserver Manfried Hard Drive"), but if you're too lenient, both clubs will jump all over you and potentially start a forfeit-inducing fight, which will get you in hot water with your crew chief, CompuKlem™ 9000. Choose your character directly from a template of The Show's 20 roster umpires, or create your own unique avatar using the proprietary Wendel-stencil Entertainment Studio Tool™ (aka the WEST), choosing your path through school for a shot at the show. Ump Show currently offers Hunter Hall and Corporate College as two paths to the pros. 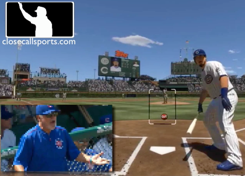 It's all your call in Ump Show, so sit back, relax, and enjoy the game.